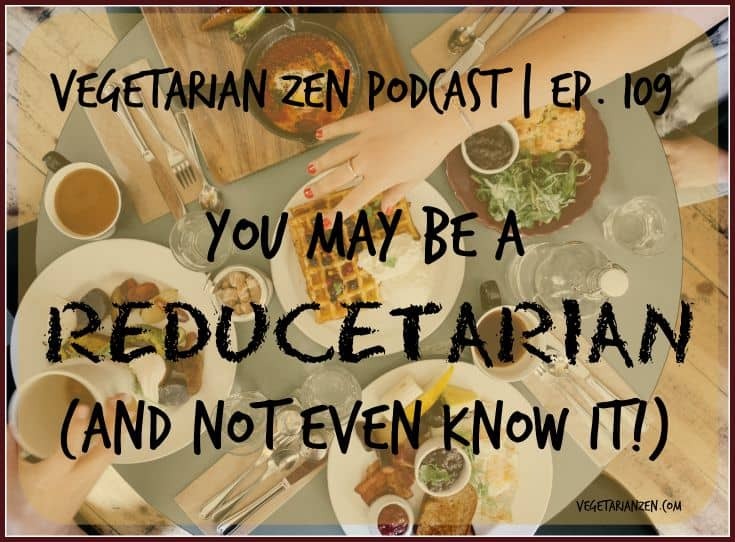 In this episode of the Vegetarian Zen podcast, we’ll be discussing a familiar concept with a new name. What exactly is a reducetarian and why is being one a good thing? We’ll find out! Consider eating less meat this week and be a Reducetarian. You CAN change the world by ordering a smaller steak or doing something more. But don’t just sit by and ignore what you already know. I love Panera, and I love what they are doing. In their effort to be healthy, can they do something about the salt in their food. Way too much. I’m not sure if Panera is franchised, but if so that could explain the wide variations in quality. I was so busy marveling over how horrible the food was I didn’t even notice salt content. Thanks for the podcast love! We love our listeners too! New listener here – just wanted to let you guys know I’m really enjoying the podcast. This episode really gave me the encouragement I was needing to keep going and keep experimenting with recipes. I’ve been half jokingly calling myself a quasi vegetarian not really knowing if there was a more appropriate terminology. Really appreciate the non-judgmental tone and great point was made on seeing that big picture in overall reduction of meat consumption. Thanks so much for your kind words! I’m so glad that you found us and are enjoying the podcast. Did you have a chance to watch the Brian Kateman talk about reducetarianism and visit the Reducetarian Foundation website? They really have a great mission. You can also find some good recipes on their website. If you’re on Facebook and would love a great place to find the support and encouragement of other vegetarians and vegans, we’d love to have you in our Peas and Carrots Society group. It’s a closed group, which means that only members can see what is shared. This is helpful to those who might not have a strong support system among their family, friends, or co-workers. It really is a great group of folks! Thanks again for your support, and please do keep in touch. Thanks for the link to the Reducetarian Foundation. I’ve got a couple recipes for kale/sweet potato hash and a quinoa bowl I’ll be trying out this week. Brian’s Ted Talk was really inspiring. just following up on last reply – have you guys heard this about fruits and veggies that are conventionally grown being less nutritious? Also that organic offers no more nutrition that conventionally grown? And what is a good alternative? Farmer’s Market only – Grow your own? Please understand I’m by no means advocating that fruits/veggies may not be worth eating by this post – I’m genuinely curious if this is true and what’s a good way to get the most out of your diet if you’re choosing to eat more fruits and veggies. I’m glad you found Brian’s talk inspiring, and that you found some good recipes to try from the Reducetarian Foundation website. Be sure to let us know how they turn out! I would love to read that NYT article you mentioned. Do you have a link to it online? We talk a lot about organic vs conventional produce on the podcast and on our website. We buy organic products (fresh produce and packaged products) as much as possible so that we are reducing the amount of pesticides, herbicides, and GMOs that we consume. Supporting organic agriculture is also a good way to help the environment. Here are the podcast episodes in which we focus on organic and non-GMO foods: VZ021: The Importance of Buying Organic, VZ022: Oh No! GMO!, and VZ091: Organic vs. Non-GMO. You might also like this blog post: Benefits of Organic Food. Thanks again for your support and questions. Please do keep in touch! I’ve posted those links below to the articles. Just wanted to say thanks for all the input on the GMOs vs Organic – it can get a little confusing! Plus with the all the news on the labeling bill – I wanted to educate myself as much as possible. Also – I’m catching up on your older composting podcast now – It’s something I’ve wanted to get into and wanted to plan our own garden for a little while but was a little overwhelmed on where to start. You guys are a wealth of knowledge and I’m so glad I’ve found your blog and podcast! Anyways – Here’s those links – let me know what you think if you get time. Thanks so much for taking the time to share those links, Leigh Ann! I’m definitely adding them to my reading list. Vickie and I are always open to any resources that will help us learn. I’m glad you’re enjoying the composting episode. We still haven’t started, but at least now we know our options. Last night we interviewed Megan Cain, an urban gardener in Madison, Wisconsin. She has a wonderful website called The Creative Vegetable Gardener on which she has a good blog and other resources. Her interview will be episode 113, which will release on August 16. Thanks again, and please do stay in touch!